You know I wasn’t even tempted to turn round. The moment they burst through that door, all ‘I’m simply gasping’ and ‘There’s still no signal’ and other such bilge-water, I was certain what they’d look like. So I stayed facing Karen at the bar, contemplating the upended bottles of spirits, rainbow stalactites that clung on for dear life as the foreign gales hit the rigging of The Shipwrights. You could say I was clinging too: I felt my hand tighten round the pint of Betty Stogs the moment I registered they’d arrived. I can remember the slight stickiness of the warmed glass. ‘Good evening’. Karen wriggled into her professional skin, smoothing down those little bumps of suspicion we all feel round here when strangers come in. Her tongue flicked briefly across her lower lip – tasting their money, I thought. For a few seconds, the tang of the sea was shafted in. Then the door slammed shut, and I heard several pairs of footsteps cross the floor. The sound suggested a sliding trot – not the stamp of boots but the confident, dancing shuffle of expensive heels. No silencing of an engine had been carried from the parking area over by the quay. They must have walked down from the village, treading carefully in their fine footwear. Chairs scraped, to the accompaniment of grunts and sighs. The shoe shuffle was towards the bar now, and the air beside me suddenly filled up with smells of aftershave and damp wool. I watched Karen place the first glass, with a faint thud, under the pump. Her bangles slid back from her wrist as she pulled on the lever. She caught it just as the head climaxed, bursting at the top of the glass but no more than a few dribbles of froth overflowing. Again, the flick of her tongue over her lower lip before she gave him a brief smile and reeled off the list. They’re suitably stocked at The Shipwrights. No surprise when he went for the Tyrells. Karen was drawing the second pint now. Her customer, pushing the first in my direction, brushed my sleeve. I must have betrayed a shudder of response. ‘Sorry – just lining up our booty. Ah, thank you my dear.’ And he stacked his nuts and crisps against my glass. He’d been smoking as he walked down here: I caught it on the breath as he turned to me full on. Karen’s eyes were on her task; she gritted her teeth, and I knew I was being challenged to take on this comer. So I shifted round on my stool, looking at him for the first time. The woollen scent had leached from a navy-blue cable-knit sweater. But that seemed the only part of him that was dark. His face was florid, his boyish curls blonde, and the eyes that hooked into mine were a pale, steely blue. He straddled his stool like a horsebacked hunter. Those cream-coloured trousers are, I believe, known as chinos. A second ago, that crotch must have been gaping at Karen. ‘Wednesday night’s usually quiet.’ I was back on HMS Redoubtable, with accent fully on board. And I registered the faintest flicker of surprise from Karen, who eyed me quickly as she put the third pint onto the bar. For an instant, his eyes left mine, as he glanced at my feet. When he spotted the carrier bag, he would realise his mistake. Now it was my eyes that plunged to the carrier, and I felt tempted for an instant to pull out that other, smaller bag, with its scutcheon of proof. But I simply nodded. It came out as a little bow – unintended, of course, and regrettable. But already he was dismounting, and so my reply – in the negative - was directed at his back as he walked away with his pint. Karen, having assembled his other purchases on a tray, emerged from behind the bar to take it over to the window table. I’m actually a bit shame-faced about my carrier bag: it could be identified as a foul offshoot of that townie culture which has invaded these parts. But then it’s an arty bag, so I’m making a statement: I’m an artist. And I like the simplicity. It’s plain Hessian, with the gallery’s lettering in lower case black. Tasteful, and with eco-friendly credentials. The trio by the window would no doubt approve. 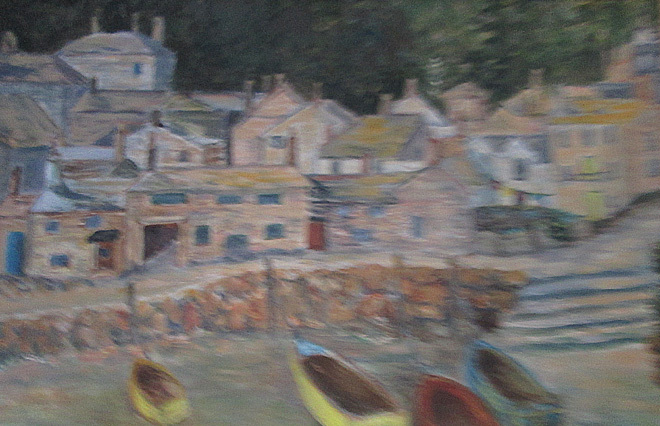 Today it contained a small canvas, as I’d been hoping to start a picture of The Shipwrights’ interior. Fat chance with those neighing stallions over by the window, loud with certainty and the din of the city stables. Yes, stallions in chinos. I’ll wager their address includes the word ‘Mews’ somewhere. Just scenting my secret, spinning it round their nostrils and snorting it out to share with the other brutes, would bring forth that terrifying laughter. They must know so many examples of the real thing where they come from. Perhaps they saw that exhibition at the Royal Academy which Tom’s bank sponsored. Yes, they’d smell me out for a pathetic sham. But it was a pity about that painting I had been planning. I don’t often try interiors. Could have been interesting. I found myself bending down to rummage through my bag. It gave me something to do, now that my beer was nearly finished, and had a curiously calming effect. I didn’t want to pick it up: there was this obscure worry that, if I tried to grip it between my knees as I perched up here on the bar stool, disaster was bound to follow. My canvas would start to poke out of the top like an uncontrollable erection. I rippled my fingers along the rings at the top of the sketch pad, plucking at them as though strumming a guitar. Then, digging deeper, I registered that reminder of the old days which I’d transformed into something for my newly crafted life. My index finger now touched solid softness – the crest of the Redoubtable embossing the felt of my emergency kit bag. I had to reassure myself that it was now the guardian of a different kind of survival. That’s what I was thinking as I stroked the outline of brushes inside it – the thick, dense crowns – that prize one made from badger hair, and the wooden handles tapering to a point. I jerked my head up to find Karen, eyes narrowed, appraising me. There was a smirk about her mouth. For the first time I noticed that one half of the upper lip drooped like a lazy eye, as if from some old injury. It might have been nice to include her in the bar scene – perhaps make the painting like some latter-day Cornish Manet. You know the picture I mean, I’m sure. That mouth of hers – it has a look of Elizabeth’s. I see it sometimes in the way Tom smiles – that swollen look, full to bursting. But now was not the moment to remember Elizabeth. Just the slightest arching of her eyebrows betrayed her surprise. Marcus Bull – normally a one-pint man. But more Betty Stogs would give me an alibi. I couldn’t leave The Shipwrights yet. Not until I’d got this lot. Got them fully worked out. And I could afford that pleasant sensation – the edges of my brain slightly blurring – now that the planned picture wasn’t going to happen. I must have been emboldened by those first few gulps, for I found myself turning round to take in the stallions’ corner. I wish I hadn’t. I felt the slop of spilt beer on my wrist as the neighing laughter carried over to me. The steely blue eyes had latched onto the signature. Actually, I was rather pleased with that one. That’s why I’d selected it to hang with a price tag at The Shipwrights. I’d worked hard to bring out all those different colour tones in the water, and to give just the subtlest hint of the boats’ reflections. The composition of those boats – the way I’d had to depart from the true scene to get that blue and yellow one foregrounded, the care I’d taken delicately painting in the chains that held them, like straining steeds, to the quayside poles – all this had been done in that wonderful tide of absorption that carries you along so completely that you don’t notice the passing of the hours. In my opinion it’s a very skilfully constructed picture – that path ending in the steps which lead to the water forming the right-hand edge of the composition, the oblongs and triangles of the clustered houses forming the upper half, the chimneys pointing from the rooftops like fat pencils leading the eye to the dark trees at the top of the canvas. It’s a bold picture, you see, for it features not the slightest spot of sky. Karen made a point of not looking at me, keeping her attention fixed on the bar as she wiped it down. But she’s always been a kind lass. Call it kindness, not pity. Clasping the warm glass, I tried to smile back at her. He’d sat down again, thank goodness, but they were still talking pictures. ‘Unlike that biscuit tin lid on the wall.’ That was the third horse of the apocalypse. Funny, that. Tom’s portfolio includes a new development on Sydney Harbour. That’s what he told me. And he snaps his fingers. I’m not sure whether he actually meant that he could buy it, or whether he was referring to his bank. But I’ve been adding up the numbers. When John Greening died last year, and his cottage was bought by a family from Wolverhampton, the village clicked into a new state of being: three-quarters of the homes here are now owned by outsiders. They are occupied, on average, for six weeks a year. Some are rented out as holiday cottages; most, however, are left empty. They stand and rot in the wet wind. I’m told that old John Greening’s house has been done up very tastefully by its new owners. No doubt. But the moisture will seep in soon enough, spreading decay. I stole a quick glance at Karen. She was polishing glasses. She can’t afford to live here, needless to say. She banged down the glass, shrugged, picked up another and started polishing again. That second pint was getting to my bladder. And I could see the third horseman bearing down on the bar, cracking his whip for the menu and making some quip about gastropubs. I was careful to pick up my carrier and take it with me to the gents. They’ve got one of my pictures on the wall in there, too. This one’s not for sale, though. I gave it to The Shipwrights after they’d re-decorated a few years ago. It’s a drawing of HMS Redoubtable. So I found myself just standing there staring at it, thinking it can’t be that bad, can it? All those little details – I’d used a photo to remind me. And I was thinking, too, about Elizabeth taking the photo, that time she came to meet me when we docked at Falmouth. My eyes were closed now, and I discovered I’d reached inside my bag – I hadn’t even noticed my hand steal inside it – and there I was, squeezing one of the paint tubes, squeezing it tight round the waist, like you’re not supposed to do. I dropped it quickly and drew out my hand. My fingers were stained with paint. Yellow ochre. Elizabeth had a yellow ochre scarf, with an olive green pattern round the border. I wonder what happened to it. I don’t remember finding it amongst her things. I opened my eyes, but my vision was blurred, and I felt the drops of moisture still springing. I couldn’t actually see whether I’d managed to wash all the paint off my fingers. I pushed against the swing door, carrier bag clasped to my chest. But I paused before re-entering the bar: through their stamping and snorting a name floated towards me. I couldn’t go in yet. The Alfred Wallis one was now taking his turn at the bar, ordering another round. His voice came more quietly now: he was chatting up Karen. I counted to ten, and then walked back into the bar.